Almost every major arts and culture venue in Thessaloniki is hosting some part of an enormous, ambitious art exhibition this summer. Titled "Heterotopias" and featuring 77 artists from 41 countries, the First Contemporary Art Biennale of Thessaloniki addresses the issue of "center versus periphery." Inaugurated at the State Museum of Contemporary Art on May 21, the exhibition is about locating "heterotopias" (misplacement or displacement) in global art and juxtaposing the real world with that of art. The philosophy behind organizing yet another international biennale of contemporary art is explained by the acclaimed art historian Catherine David, former director of the famed Documenta art expo in Kassel, Germany, and currently one of the three curators responsible for the Thessaloniki event. The French curator was invited to recommend works by artists from the Middle East. Contemporary Art Museum director Maria Tsantsanoglou is curator of art from Central Asia and from the countries of the former Soviet bloc, while Jan-Erik Lundstrom � director of Sweden's Bild Museet in Umea - recommended artists from Africa and Latin America. David's recommendations reveal a generation of artists who worked according to their own rules, under particular political circumstances, and who transformed reality in a truly essential manner. For many of the artists this is the first time their work will be on display at an international event. What can yet another biennale offer? I don't feel as though we are starting from zero, because the State Museum of Contemporary Art already has a world-renowned collection (the Costakis Collection). The event, furthermore, will offer an opportunity for the public and critics alike to become acquainted with works of art that are not normally represented in conventional international biennales organized in Europe. Does this event have a possibility, in your view, of eventually becoming on a par with the major biennales (Venice, Sao Paolo, Sydney, Berlin)? There are biennales that are held mechanically and artists who show their works as decor. A very interesting event in my opinion is that at Sao Paolo, because it expresses the social environment through dialogue. Berlin's, even though it has been held six times already, has failed to create a particular profile. I think that for a biennale to survive among others, it must have an identity. Of course, once the Thessaloniki event is over we will see what the city can do to promote and support it. But it is very important not to become restricted to the two dozen artists who recycle contemporary art. Do you see any early indications as to the identity of the Thessaloniki event? All the curators are working with artists who in the main don't belong to the so-called Western world. Our objective is not to present an exhibition that is exotic, but to present work by unknown artists who will initiate a dialogue with the so-called Western world. What is certain though is that we are not looking at their art through a protectionist or colonialist perspective. 1967 | The Israelis occupied the rest of Palestine, and Qalandia airport became a lonely military zone, except for the fact that it was located at the entrance of Ra- mallah, where many visitors from Jerusalem passed. 1987 | The first Intifada erupted and the airport became a line of confrontation between Qalandia’s residents and Israeli soldiers. 2001 | The second Intifada broke out. The Israelis built a massive checkpoint next to the airport which overshad- ows the camp. Qalandia checkpoint became the main crossing between Northern and Southern Palestine. 2003 | The Israelis built the notorious apartheid WALL to exclude the Palestinian population in the occupied West Bank. Qalandia became even more isolated from its surroundings by giant concrete blocks. 2005 | Yasser Arafat died in a hospital in France and the Palestinian people are left to fill the void left behind by this icon of their national liberation struggle. she got used to the people visiting her laying in the sun and having barbecues in her pond. Soon Abu Jamil’s golden fish became a local attraction for the refugees. 2019 | After many years of living in what became an overcrowded open air prison, the Palestinian Mirror Party ( PMP ) decided to cover the WALL with mirrors to create the illusion of more space and seeing their re- flection everywhere, people began to wonder how they got in there. 2020 | Qalandia School changed its name to Impossible School. And the students closed the basketball rings. No goals in the game. 2023 | An Israeli company for tourism built near the checkpoint a discothèque bar with an aquarium and one golden fish. They called it Checkpoint Bar to en- courage trippy-political tourism. 2025 | Palestine made the Guinness Book of World Re- cords for the biggest mirror in the world that caused many tourists to come and visit Palestine. 2028 | Checking in the checkpoint changed from palm scanning to an audiovisual-check. As you look into the blue light you say Weehaa. 2030 | The Israelis fixed laser lights on the holes of the WALL to tighten security. The Palestinians were furious as the holes were meant to help remove the WALL, not to fix laser points in it. 2033 | The Palestinians start talking about the revolu- tion again. They build the STONE GARDEN for the 50th commemoration of the first popular Intifada in 1987. 2037 | The Fish died, all the camp cried and said the fish died, the sea died. They took out the water and bur- ied the fish and called it the FISH TOMB. Then the visits changed from picnics, singing and dancing to a Mar- tyr’s memorial, where flowers are laid and silence kept. 2044 | The Palestinians improved their economic situ- ation after a complete boycott of Israeli products. This prompted many investors to move from Dubai to Ra- mallah. 2047 | The Palestinians built a garden in the camp and called it the “Flower Garden”. It became a romantic space for young and old lovers from the camp. 2049 | Students at Qalandia School opened their bas- ketball rings but they made it very big. 2052 | Palestinians refuse to say “weehaa” while pass- ing the checkpoint. 2058 | The Israeli government shut down the Mirror Party offices in Jerusalem as the police launch a cam- paign against anyone possessing a mirror. 2060 | The Israeli company for tourism changed the golden fish in the Checkpoint Bar to shark fish to pro- vide more adventure for the tourists. 2067 | Three candidates from the Mirror Party won seats in the Israeli parliament. 2069 | The Mirror Party celebrated their 50th Anniver- sary by creating “The Mirror Garden” – a garden with a big hand mirror where people can look at themselves that came with removing the lasers lights from the WALL after the International Criminal Court rules in their favor. 2072 | Students at Qalandia School made their basket- ball rings smaller to match the size of the ball exactly, for more precise aims. 2075 | Cinema Dunia opened along with the Qala Mod- ern – the first modern museum in Qalandia. 2081 | Someone from Jerusalem buys the Checkpoint Bar from the Israeli tourism company that owns it and converts it to AL Ajami Restaurant - Bar, featuring five golden fish in the aquarium. 2085 | The new Israeli government removed Qalandia checkpoint. The Palestinians kept the mike left be- hind and change the checkpoint to Speechpoint, a free speech area where people can say or sing what they like. 2087 | One hundred years after the First Intifada, Qa- landia’s residents celebrated in the Stone Garden after the Mirror Party’s historic agreement with the new Is- raeli government, which gives the Palestinian the 1967 lands ( the West Bank, Gaza and East Jerusalem ) along with the right of return for all refugees. They remove the cement from the wall and fix mirrors on the other side. For some it becomes known as the Mirror Wall, while I call it Maya Wall. Abstract | My research is located in the theatre of war and is concerned with the military use of terrain models, camouflage and decoys to create strategic scenarios. This study forms the context for an exploration of the de- ployment of similar scenographic strategies in contem- porary artistic practice. Drawing on my research into the use of simulation and deception in the target landscapes of modern military conflict, I discuss how artists are representing the distortions, disinformation, the carto- graphic omissions, the black worlds, and the silences of erasure and re-location; annihilation and elimination. By addressing the myths and narratives of dis- closure, secrecy and invisibility, their projects present a challenge to the ascendancy of military procedures and work to reclaim the real. The Palestinian artist Wafa Hourani’s work rep- resents the scenographic and often fatal strategies for staging the political. 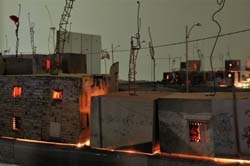 Through the optical and meta- phorical forms of his models dioramas the political scene is set and the narratives of appearances and disappearances,inclusion and exclusion, observation and control are told. His work illustrates the Baudril- lardian illusion – the tiny distance that makes ‘the real play with its own reality’ ( Baudrillard 1999: 173 ). Qalandia is the story of a refugee camp estab- lished in 1948. It tells how the airport nearby changed from Qalandia airport to a military zone and then there was a checkpoint and then the separation wall. Origi- nally working as a documentary filmmaker, Hourani stopped ‘filming reality’ and began to think how to use the details he had been recording inside the images in another scenario. 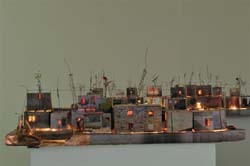 He decided to make Qalandia 2047 as a model using the photographic images from the camp. By inserting the ‘real images’ into the model, Hourani created a representation of a world within a world. Event filled works like Qalandia reveal so much more than location. They have a spatio-temporal con- sciousness lacking in more supposedly ‘sophisticated’ maps. But as Paul Carter argues if such mappings ex- ist at all in mainstream consciousness it is ‘as aes- thetic toys, art objects, the mythic residue of collective dreams’ ( Carter 2009: 17 ). The toy model with its as- sociations of craft, nostalgia, and infantile desires of control is commonly perceived as an enclosed world set apart from the ‘real’ – a diminutive elsewhere. Stew- art, however, gives us a more generous interpretation of the toy’s purpose and meaning. She describes how the toy is ‘a device for fantasy, a point of beginning for narrative. To toy with something is to manipulate it, to try it out within sets of contexts’. By her definition, Ho- urani’s toy world is ‘a miniaturised real world in which the relationship between materiality and meaning are tested’ ( Stewart 1993: 58 ). Wafa Hourani employs the strategies of humour that the philosopher Simon Critchley recommends in dealing with ‘tragic fate’. According to Critchley, ‘In the absence of Aristotelian happiness, in a world where happiness has been reduced to the maximum satis- faction of transient inclinations, it is in practices like humour that we find an experience of non-delusory, non-desultory and non-heroic sublimation’ ( Critchley 2007: 82 ). Through the use of humour Hourani’s models perform an important and powerful critical function. They charm and amuse us with their joyous and exotic depictions of life elsewhere but we go away disturbed by the presence of the ‘other’ and the realisation that there is this place somewhere. of terrorism and global warfare has extended the com- bat zone; the garden itself has become strategic as the war of terror is fought in homes and backyards of the enemy. As the human geographer and social scientist, Nigel Thrift observes ‘The image of the complete battle separate from the civilian life around it, is antiquated, unreal [...] elsewheres increasingly do not exist’ ( Thrift 2007: 263 ). ‘constitutes both a physical expression of our fear and insecurity and our expectation of the other, the alter- native, the utopian, the future’ ( Solà-Morales 1995: 121 ). Phillips in The Slow and the Blind tell us that in its ear- liest manifestation, the skopos ( from the ancient Greek target ) was one who watches out for and is the guard- ian for the community, a kind of epi-scopus or overseer [...] later the word skopos became associated with the military and referred to a spy or scout who seeks out and marks the target [...] an intelligence gatherer and surveyor of the battlefield. Bishop and Phillips con- clude that ‘In these senses, then, the scopic can both mark and target, as well as merge into the episcopal functions of governance and an overseeing of the na- tion and its interests’ ( Bishop / Philips 2010: 21 ). Houra- ni has taken on the role of the skopos as epi-scopus and through his narrative constructions is challenging the militaristic initiatives that attempt to bring about erasure. He is demonstrating through the model the scopic conditions of surveillance and resistance. 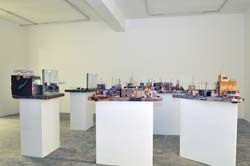 Hourani has set no time limit on development of his projects. In theory, Qalandia could be endlessly modified. Although he refers to photographs and his direct experience of the locations represented, the mimetic relationship between the model and its refer- ents is selective. The challenge for Hourani is to create a fictional world which can persuade the viewer of its validity as a location. At the same time, his projects resist the norms of cartographic representation what Massey calls ‘the claims to singularity, stability and closure’ ( Massey 2005: 109 ). They are ongoing stories. It is through metaphorical and mythological specula- tions that these models make visible the ‘real’. In Carl Schmitt’s ‘political mythology of world order,’ it is the poetic, mythic and symbolic elements – as opposed to more rationalized forms of discourse – which help make the world thinkable, map-able, and thus form conditions of certain forms of ‘global’ political action ( Dean 2006: 1 ). ‘they were initially conceived to serve, and helped the process that erased them from the ground only a few years after they were first recorded on paper’ ( Weizman 2006: 161 ). Paul Carter calls this annihilation of space, a ‘spatial sleight of hand’ a ‘geographical conjuring trick’, which ‘erases from collective memory [...] every trace of elsewhere in either time or space’ ( Carter 2009: 17 ). These are the gaps in representation – the erasures, the blind spots on the maps that Hourani addresses in his work. He constructs a strategic and scenographic response to the militaristic occupation and determina- tion of space by re-imagining the territory. Through his actions – acted out in the staged space, they engage in what Leach describes as the ‘transitory and fluid dis- course of territorialisation’ ( Leach 2006: 181 ). 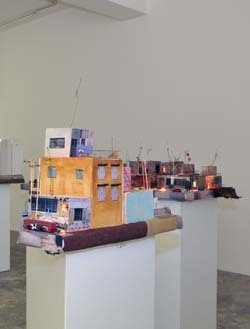 Qalandia is an imaginative demonstration of the ‘politics of de- sire’ and the possibilities of place making. Hourani’s models project into the future and address what might be. They are discursive and speculative representations of elsewheres that are no longer nowhere. References Baudrillard, Jean ( 1999 ), Fatal Strategies, London: Semiotext( e ). Bishop, Ryan and Phillips, John ( 2010 ): Modernist Avant-Garde Aesthetics and Contemporary Military Technology, Ed- inburgh: Edinburgh University Press. Carter, Paul ( 2009 ), Dark Writing: Geography, Performance, Design ( Writing Past Colonialism ), Honolulu: University of Hawaii Press. Cosgrove, Denis ( 2000 ), Landscape and the European Sense of Sight in K. Anderson, M. Domosh, S. Pile and N. Thrift ( eds. ) Handbook of Cultural Geography, London: Sage Publications Ltd.
Critchley, Simon ( 2007 ), Infinitely demanding: Ethics of Commitment, Politics of Resistance, London: Verso. Dean, Mitchell ( 2006 ), A Political Mythology of World Order Carl Schmitt’s Nomos in Theory, Culture & Society. Hourani, Wafa, Interview with the author, October 2009. Jackson, John Brinckerhoff ( 1980 ), The Necessity For Ruins, Amherst: University of Massachusetts Press. Leach, Neil ( 2006 ), Camouflage, Cam- bridge, Mass: The MIT Press. Massey, Doreen ( 2005 ), For Space, Lon- don: Sage Publications Ltd.
Mendieta, Eduardo, Imperial geogra- phies and topographies of nihilism in City Vol. 8( 1 ) 2004. 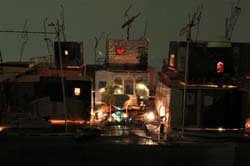 Parcell, Stephen ( 1996 ), The Metaphoric Architecture of the Diorama in A. Perez- Gomez and S. Parcell ( eds. ) Chora: In- tervals in the Philosophy of Architecture, Montreal, Vol. 2 no. 198: McGill-Queen’s University Press. Robins, Kevin ( 1996 ), Into the Image: Culture and Politics in the Field of Vision, London: Routledge. Solà-Morales Rubio Ignasi ( 1995 ) , Terrain Vague in C. Davidson ( ed. ) Any- place, Cambridge, Mass: The MIT Press. Rugoff, Ralph ( 1997 ), Homeopathic Strategies in At the Threshold of the Visible, New York, Independent Curators International. Smith, Jonathan ( 1993 ), The Lie that Blinds: Destabilizing the Text of Land- scape in J. S. Duncan and D. Ley ( eds. ) Place / Culture / Representation, London: Routledge. Stewart, Susan ( 1993 ), On Longing: Nar- ratives of the Miniature, the Gigantic, the Souvenir, the Collection, Durham: Duke University Press. Thrift, Nigel ( 2007 ), Immaculate Warfare? The Spatial Politics of Extreme Violence in D. Gregory and A. Pred ( ed. ) Violent Geographies: Fear, Terror, and Political Violence, New York: Routledge. Vischer, Robert ( 1983 / 1994 ), On the Optical Sense of Form: A Contribution to Aesthetics in H. F. Mallgrave and Elefthieros Ikonomou ( eds. ) Empathy, Form and Space, Problems in German Aesthetics 1873-1893, Oxford: The Getty Center For The History Of Art. Weizman, Eyal ( 2006 ), Temporary Facts, Flexible Lines: The Concept of Security in Israeli Territorial Design in Igmade, G. D. Bruyn, D. Hundsdorfer et al. ( eds. ) 5 Codes: Architecture, Paranoia and Risk in Times of Terror, Basel: Birkhäuser Architecture.